Analysis: Microsoft will be well represented at SC08 (for example, a half-day session on “Windows HPC Server 2008, a Programmers Perspective”) and two MSFT guys I know (Dan Reed and Burton Smith) are on the conference Steering Committee… and one of the main speakers is David Patterson, former ACM president and former chair of Berkeley’s Computer Science department, now director of both the Reliable Adaptive Distributed Systems Lab and the Parallel Computing Lab at UC Berkeley, which is co-funded by Intel and Microsoft. “Multi-Teraflops Simulations of Disorder Effects on the Transition Temperature of the High Tc Superconducting Cuprates” by Gonzalo Alvarez and a team from Oak Ridge National Laboratory and Cray Inc.
“0.374 Pflop/s Trillion-particle Particle-in-cell Modeling of Laser Plasma Interactions on Roadrunner” by Kevin J. Bowers and a team from Los Alamos National Laboratory. Speaking of teraflops, I spent last week at the GEOINT conference in Nashville, and will be publishing a more substantive post on some of that conference’s content (speakers and panels). But I also wandered down to the exhibit floor a few times, of course, and actually made my way (as is my wont) past every single booth, at a minimum glancing at the products and in many cases getting the full pitch. True to my oddball form I was most taken not with the geospatial-intelligence software and solutions on display but with a piece of hardware: the Cray CX1 used in the Microsoft booth as a platform to show its potential for high-end geospatial uses running Windows High-Performance Computing Server 2008. 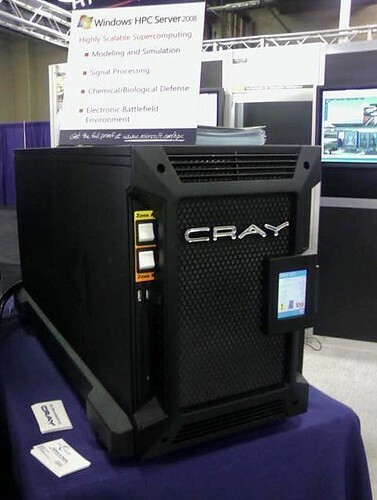 I snapped the accompanying photos with my cellphone, so they’re not the best, but the Cray website page about the machine has better photos if that’s what you’re looking for. What you should be looking for is performance, and they bill this box as “for individuals and departmental workgroups who want to harness HPC without the complexity of traditional clusters.” For the GEOINT crowd, that translated (as the Windows HPC Server sign says in the photo) to computational support for Modeling and SImulation, Signal Processing, Chemical/Biological Defense, and “Electronic Battlefield Environments” (think realtime Future Combat Systems for example). runs on standard office power! And one Microsoft partner was showing at GEOINT their specialized CX1 version for deployable environments, Criterion’s “Cube C15” which has been benchmarked to750 Gigaflops of computing power but needs no extra cooling power – it runs at room temperature. So, forget the cloud, and put cumulo-nimbus power in your office? For some scenarios, might be worth a shot. Oh, by the way, in the photo, the little pile of stickers on the table beside the box read, “My other computer is a Cray.” I have one on my laptop now…. That thing looks like a tank!